Today, I’m going to talk to you about communicating with your customers. And the reason this is important is because too many people don’t. Back on, was it Monday, I talked about a lead generation system and that you need to be generating leads to create more customers. Because you generate a lead and then you convert them into a customer and that’s marketing, or part of it. And that’s where customers come from. Of course you can be complacent, you can sit back and just hope they come to you. You can go put an ad in the Yellow Pages like people used to do in the 1980s, which is when I used to do it and waste your money there and hope people will come; or you can be doing this. 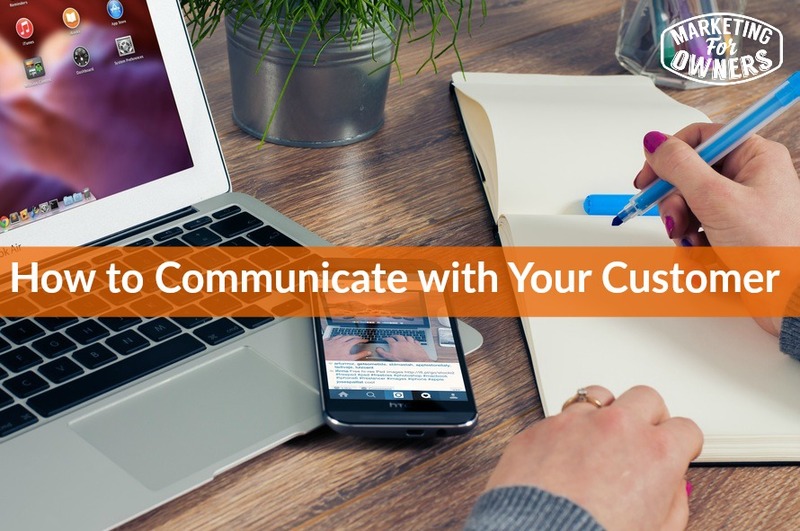 Now this doesn’t matter whether they are a potential customer or whether they are already a customer, you must communicate with them, it’s as simple as that. So this isn’t so much a how to communicate, this is more of a you must! And how can you communicate? Well, here is the thing, there’s lots of various different ways. It doesn’t matter whether you are online or off-line. And when I say off-line, is what a lot of you are thinking… Online to me seems the new normal, but off-line is what most of you think is normal, it’s the normal business that is not based around a website, is not selling online. The first and the best way is face to face, that means to actually go and visit them. Make any excuse to go and visit a customer. You can go and you drop in something, drop in a gift, that gift could be a box of chocolates, a bunch of flowers, a bottle of wine. Be careful with the booze with customers because some people have certain religious beliefs, or some people are not drinkers, or some people don’t think it should be encouraged so much these days. It’s up to you, but make a sensible decision there. But the gift could be a survey, it could be dropping in a catalog, or something like that, it could be absolutely anything. So visit them, make any excuse and visit them. The second-best is to telephone them. Again, make any excuse to phone them. So these are not sales calls, this is not tele-sales, this is not the boiler room stuff, this is an excuse. Perhaps they just had a call from one of your service engineers, they’ve just have an appointment with you, maybe you are a dentist, they just had something done. Phone them up the day after, two days after and ask them what they thought, them, ask them if there’s anything that could be improved. Talk to them, ask for their opinion, because that makes people feel important. Tell them you don’t actually have time to speak to every single customer, but they stood out as someone that you feel you would appreciate their opinion and you just had a couple of questions you wanted to ask them. Or, you can even make it just one, — what did you think of the service? And tell them to be honest with you. Tell them –“Don’t just tell me it was great, or don’t just tell me it was awful. Tell me what you think because we want to constantly improve and it’s only by asking people such as yourself, for your opinion that we can do that”. Doesn’t that sound great? Wouldn’t you fell pleased if someone asked you that? Yeah, I would. No one does, well not many. We do. So the next one after speaking to someone for real is e-mail. The beauty with e-mail, and right, so e-mail, you should never use e-mail as the lazy person’s way alternative to phoning them. We used to do in our credit control, though we don’t give credit to anyone; occasionally schools, churches and charities we may give credit to and then quite often we have to chase them out because quite often they have other people paying the bills and they don’t realize they are not being paid. And so we had a system which works wonders, but we had someone at one point, who decided that they were too busy to phone and so they would just e-mail people. E-mails, you don’t know if people even receive the e-mails or whether they open them, whether they go to their spam folder. Don’t use that unless you have to and unless it’s in bulk and unless it’s just casual follow-ups. So if you’re using e-mail, unless it’s one at a time, use an e-mail service provider like AWeber, InfusionSoft, , Mail Chimp, Convert Kit, Get Drip, or any others. Something like that, but put them on the database because that gets through spam filters and it’s done professionally and it’s got the “unsubscribe” and complies with the spam act and everything like that, so do that. But after those, there are things such as letters, actually writing. One of the things I recommend when you follow up, when you’re trying to spend those hundred days after a customer is converted into a purchaser, in our seven Ps, purchaser, you want to move them on to becoming a preacher. So then you work on them. One of the things I recommend is sending a handwritten card. Now we’ve had lots of examples of this and generally, I am from the UK and embarrassingly none of them are from British companies. They all come from America and they get sent from overseas and quite often for goods that are free because I have mentioned on social media or something in my communication with them and they want to say thanks. I am impressed. Companies like Edgar, Buffer,Trello, and companies like ROI Revolution, all from America, all have sent me gifts. In fact, ROI Revolution sent me something where the postage was twenty dollars. Not bad, eh? And now I am mentioning them to you. It works. So things like that, so hand written, but though you can actually send typed ones. But make it a reason, make it worth interrupting them. end out a newsletter, but make sure the newsletter is beneficial, not just a load of rubbish about you and about what you’re doing, they don’t want to know, they’re only interested in them and how it applies to them. Make it worthwhile. Then there’s adverts. The other way to communicate is by re-targeting ads or re-marketing it’s sometimes known. Facebook is the best for this. I’m not going to go into the details now, but this is one of the cheapest ways of advertising to people who visited you, possibly haven’t bought. There’s lots of ways to do it, you can separate them out into people who bought, people who haven’t bought, people who looked at that product, people who looked at this product, oh, so exciting, so cheap, great return on investment. So re-targeting, lots of ways, but please, the message is, communicate with your clients, communicate all the time, don’t let them forget you, potential clients and clients. It’s Thursday, time for a drive time podcast and one of the skills that you can pick up for communicating is copywriting and writing. So today we are recommending John McIntyre. 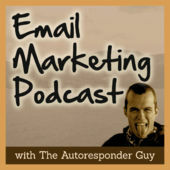 Now his podcast is called The McMethod E-mail Marketing Podcast. He will explain to you how to e-mail market. We all should be using e-mail marketing and the guy is a copywriter, he’s a genius. So look it up The McMethod E-mail Marketing Podcast, just look that up in iTunes or look it up online in Google, you will get to the podcast. Sometimes it’s sporadic, but even the old, go back and listen to the old stuff, it’s all there. When someone starts a new one quite often their first ones are the best, go back and listen to the first episodes, he has got information that you would pay good money for. And it’s free. And tomorrow, it’s Friday, I’m going to be back with a weekend challenge that you’re going to enjoy. I’ll see you then.